Following hydraulic and electrical tests in the Titan facility, the three-tonne high frequency antenna was installed on 7 September. 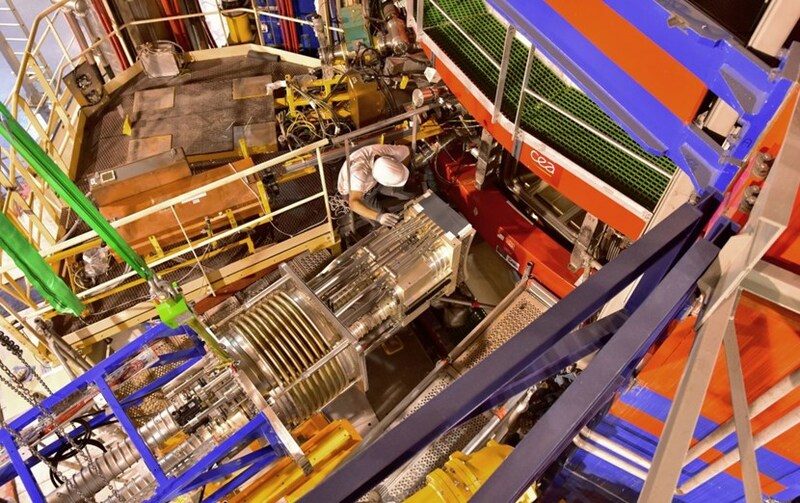 This summer, WEST's high frequency antenna spent one month in Titan's punishing environment—the last and most severe of its trials before being integrated into the refurbished CEA-Euratom tokamak Tore Supra. The component is one of three identical antennas that will deposit an ITER-relevant heat load of 10 MW per square metre on WEST's tungsten divertor. 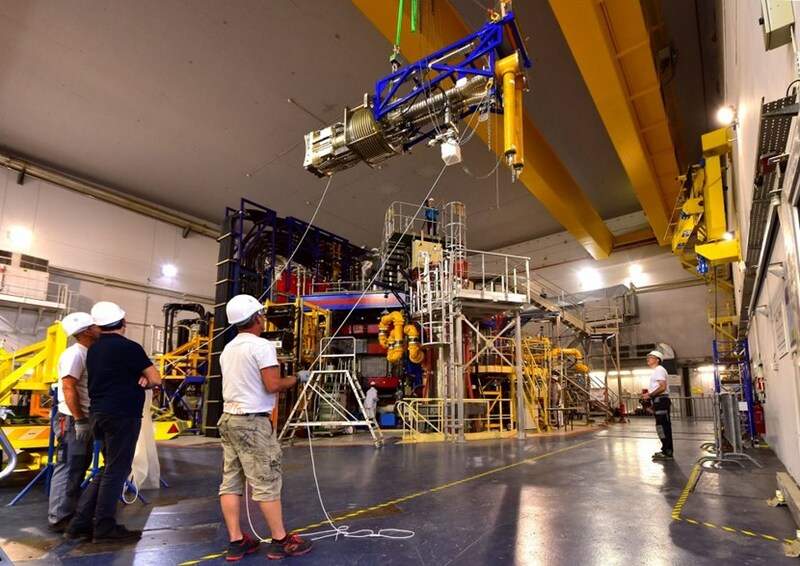 Titan (Testbed for ITer ANtenna) is a 17.5-cubic-metre vacuum vessel that can be heated to temperatures up to 250 °C. It is equipped with a water loop capable of providing pressurized water (44 bars, also at 250 °C) and can be connected to a high power radiofrequency generator for electrical tests. Looking strangely like a giant squid, the antenna is positioned in front of its dedicated 60 x 80 cm port. In the high-vacuum atmosphere of Titan, the 4.5-metre-long, 3-tonne component was submitted to three temperature cycles in order to induce dilatations and reveal possible leaks in its high pressure cooling circuit and vacuum volumes. The antenna's capacity to withstand high voltage was also tested and the parameters for its optimal performance determined. All tests were completed successfully and on 7 September, the spectacular and delicate operation of inserting the component into its port was performed. One man inside the machine, another outside; a bit of pushing a bit of pulling and the antenna is in. Carefully balanced with lead counterweights, the antenna—looking strangely like a giant squid—was lifted by crane, pulled by ropes and guided by hand all the way into its dedicated port in WEST. (The port measures approximately 60 x 80 centimetres and is about four times smaller than ITER's average port). 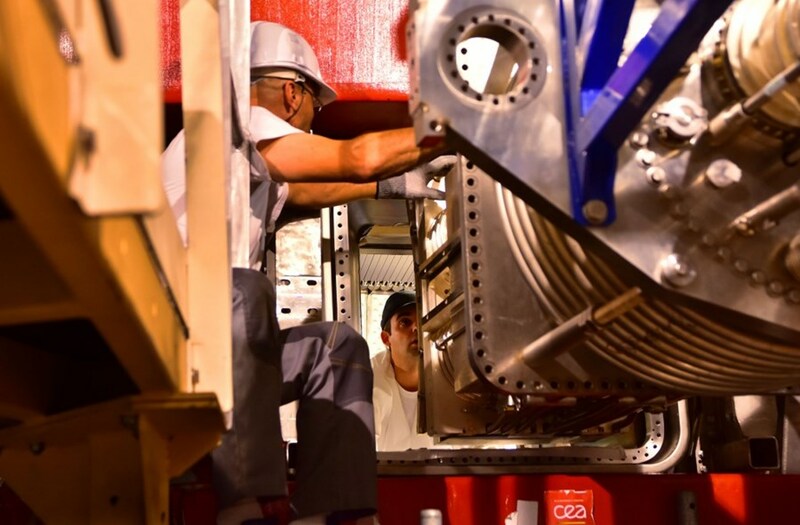 By October, when all the ancillary systems are installed (cabling, hydraulic positioning devices, heat insulators, diagnostics ...) the antenna will be ready to face another punishing environment—the actual plasmas of an ITER-like tokamak.